Carissa Christner, the Promo Code Fairy! Have you been considering trying apps at your library, but the cost of good apps, plus figuring out which fund account they should be charged to and what in the world to do about the whole not-tax-exempt thing has just got you all frustrated and stuck in your tracks? GOOD NEWS, EVERYONE! Because of some recent conversations between Little eLit and some (very generous!) app developers, we now have a stash of around 300 app promo codes just waiting to be used by you! All you need to do to access the list of available apps is to sign up to be a member of the Little eLit Think Tank (send us a note to ask to join) and we’ll send out a link to a Google Doc list of currently available apps. Choose your favorites (as many as you’d like!) and e-mail your wishlist to me, the App Code Fairy, and I’ll send you the codes! 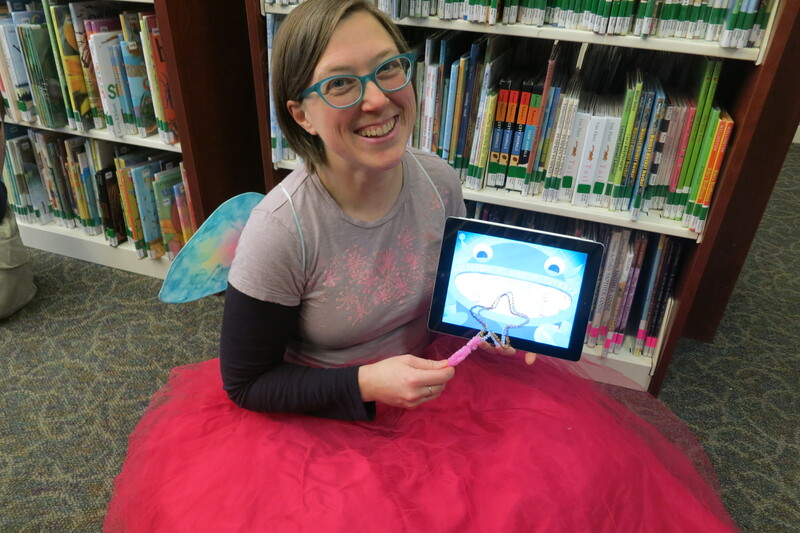 One of the best ways to strengthen the relationship between libraries and apps is for librarians who have used apps in their programming to share about that experience. That sharing can be in the form of a blog post for Little eLit, feedback directly to the app developer (with suggestions for improvement or ideas for new apps that would be useful for librarians or families to use), or filling out this short survey once you’ve had a chance to try out the app. Responses are NOT required by us or by the developers, but (especially if you have a particularly great experience or great “learning experience” OR if you have some helpful feedback for the developer on ways to improve the app) we would really appreciate it! Posted on February 20, 2014, in Literacy. Bookmark the permalink. 3 Comments. As a long time author/ illustrator (over 60 books published) who is now doing apps I would love to share promo codes with librarians. We have 4 apps published including Bean’s Night, made Kirkus Reviews best book apps of 2013 list. OH! I LOVE Bean’s Baby and use it in my workshops! Yes, please, I’ll hook you up with the Promo Code Fairy! As you know, I have already received your direct email, but just found this. You cannot imagine how GREAT it makes me feel!! Thank you so much for helping Bean reach the little ones. Promo code deal is set.